3D Coordination is not just limited to above ceiling coordination. The BIM Team working with the project superintendent and subcontractors can coordinate the installation of site utilities. This includes ductbank, sanitary sewer, storm sewer, gas, and any other site elements. A civil plan and a couple of meetings are all that are necessary to ensure a smooth installation of underground work. 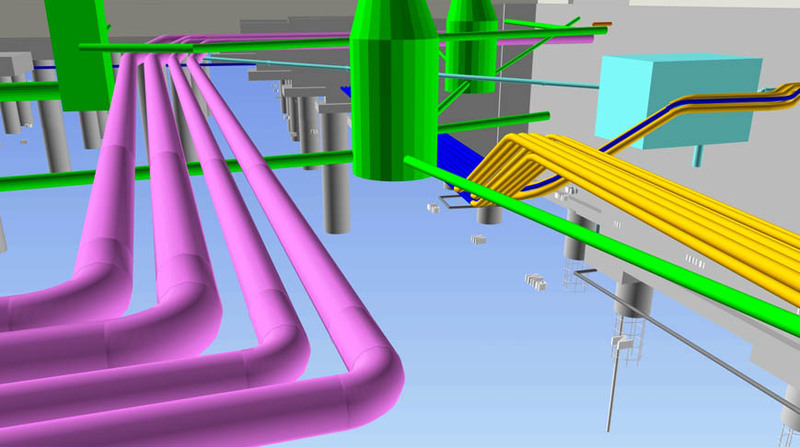 The image below shows the process chilled and hot water (purple) entering the building from the University of Alabama Energy Plant. The yellow conduit represents the ductbank that connects from the Main Electircal room to a smaller electrical room on the other side of the building. The light blue is an acid dilution tank connected to the acid waste system and. The green objects are the storm and sanitary swer systems. the manholes are modeled based on the shop drawings provided by the civil subcontractor accurately portraying the inverts and elevations of the pipes. Elevation data was provided from the model to field supervision to assist them in verifying the subcontractors installed their respective scopes at the correct locations and elevations.